Today, I am here with another post in which I will tell you about Xamarin.Forms Animation with PopupPage. Before going through the article I would like to tell you about Rg.Plugins.Popup. It is a very useful Plugin used to create popup windows in Xamarin.F forms. We can also put animations to these popups so that they look more attractive and enhance the user experience. This article is about XF Animation with PopupPage. In this article, we will learn how to use XF Animation with popup page. 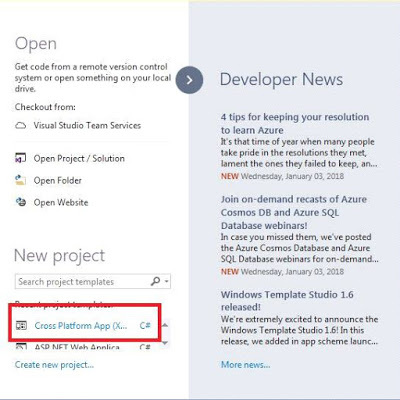 Open Visual Studio and select a "New Project". Now, select Cross-Platform App, give the project a name, and set the project path. Then, click OK. 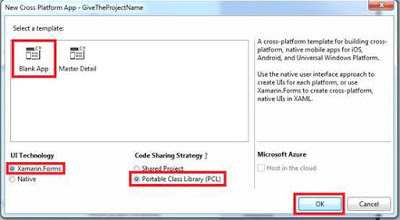 Select the template as "Blank App" and code sharing as "PCL". Now, we can install Rg.Plugins.Popup. Right-click on the project, then click on NuGet Package. Click Browse and search for Rg.Plugins.Popup, select Plugins, and then check the projects in which we want to add this plugin. Now, we are creating LoginPopupPage.xaml PopupPages. Now, we are creating RegPage.xaml PopupPages. Write the following C# code for the animation that will appear when opening registration page. The XF Popup.Animation is working successfully. To watch the video of working animation, you can click here.